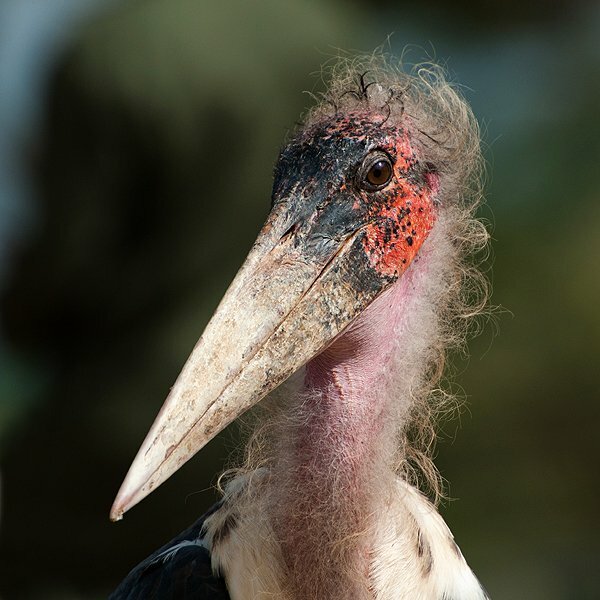 Marabou Storks are ugly/lovely. They have character. They are unmistakeable. I won’t expend too much energy trying to describe them… I’ll just let the pictures do the heavy lifting this week. 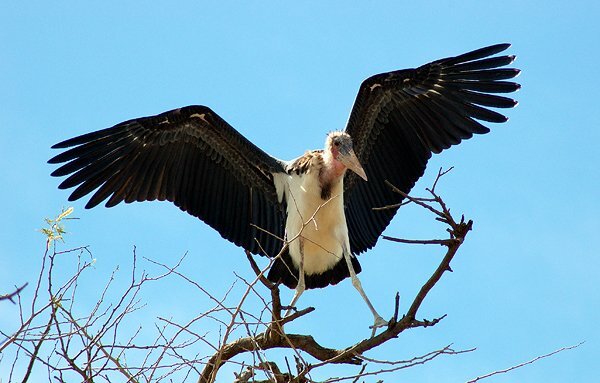 Marabou Storks are gigantic. Twelve feet tall at the shoulder! OK it’s more like five feet from head to toe, but they do have wingspans that approach 10 feet, which is getting into Andean Condor territory. And they have hair! 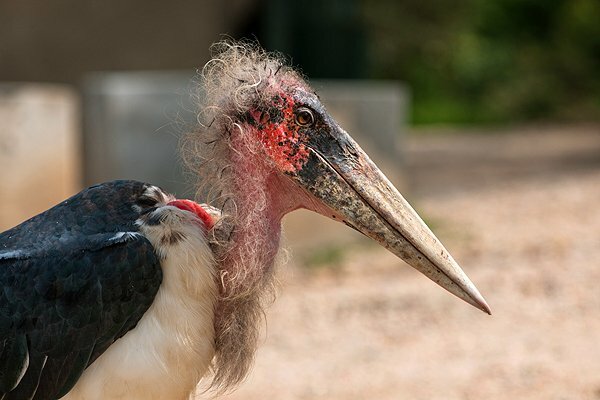 OK feathers, sure, but it looks like a wispy white afro that doesn’t stop at the neck. Lovely. 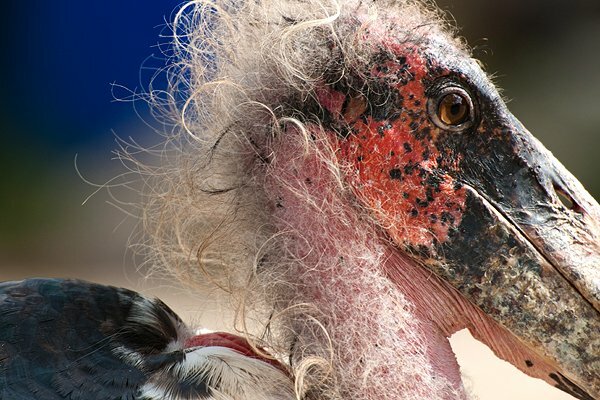 Why concentrate on festooning a head with glamorous feathers that will be tarnished when plunged into carcasses and garbage bins? Better to go with a low maintenance cut and get on with life. And just look at that face! They are just amazing. When they turn around you get a sense of why they are sometimes referred to as the “undertaker bird.” They stroll around in their dark cloaks and come to collect the dead. Add that sense of impending doom to an atypical appearance and you get a bird that stirs strong emotions in people. I happen to love them. Just look at that green blooming underneath the black feathers. They also frequent some beautiful places. And some not so beautiful spots. Just like anywhere else, worlds collide. This bird knew the drill. It walked a long way to get to this garbage and began to remove it’s contents with a practiced precision. At a certain point I stopped being an observer and photographer and intervened. For one, I knew that someone would have to clean up the mess the bird was bound to make. But what actually snapped me out of documenter mode was disgust. This is a family site so I won’t mention the what it managed to extract from that bag of garbage. Suffice it to say these birds provide a great service to the savannah. They clean up and they do it well. 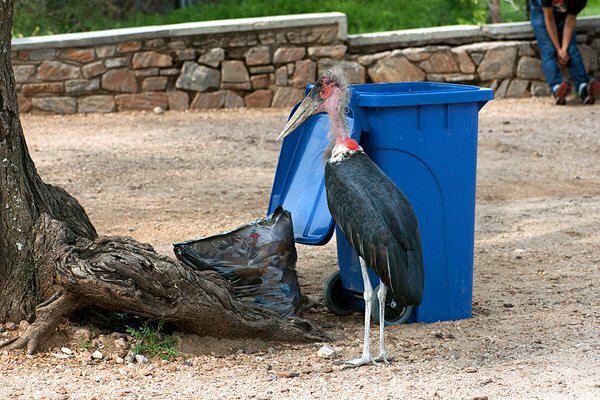 But I don’t think they need to be eating our trash or cleaning up after us… even though they seem to relish the idea. They are bad, bad boys. I love them just for what they are (or inspite of that?). Thanks for this incredible series of photos! They are handsome birds. Wonderful photos. Never saw a photo of these before. Truly amazing (and kind of eerie too). Great photographs as usual. 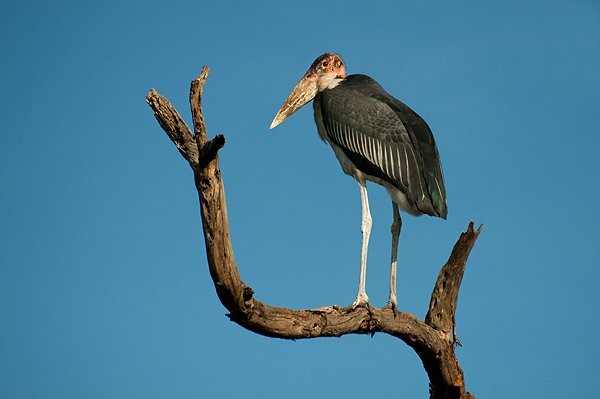 Dont forget the Greater and Lesser Adjutants. Cool storks as well! 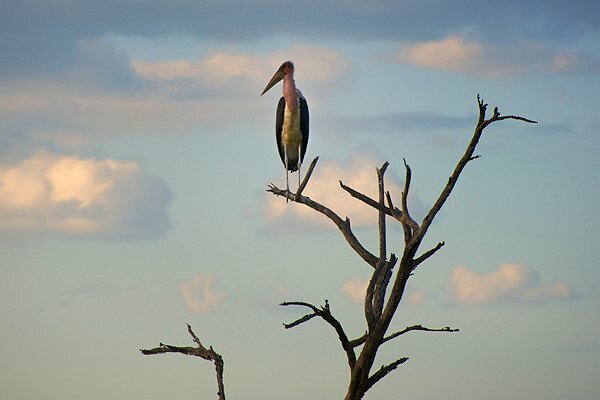 marabou – never thought the name went with the stork. As vultures, they have such an ominous charm and incomparably creepy good looks. Thanks for sharing. Great photos. At 100 meters in the air they are truly beautiful as they soar on the air currents for long periods without flapping a wing.